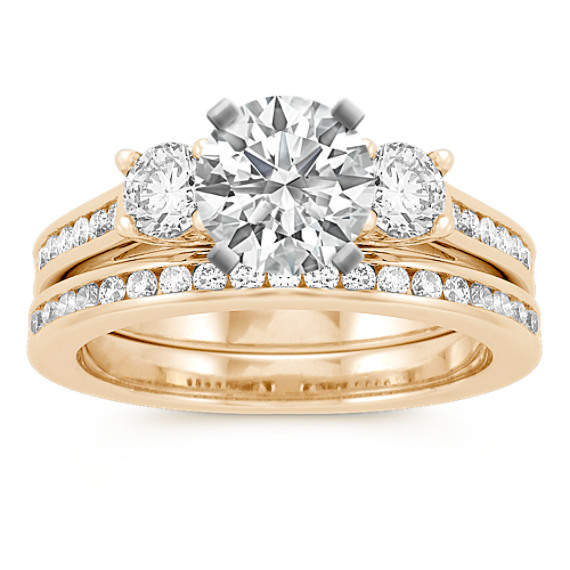 Three-Stone Cathedral Channel-Set Diamond Wedding Set | Shane Co. This brilliant cathedral wedding set features 34 round channel-set diamonds at approximately .99 carat total weight. Each diamond has been hand-selected for maximum fire and brilliance. These glorious gems are set in a classic superior quality 14 karat yellow gold setting. To the complete the look, add the center diamond of your choice. My husband and I upgraded my ring to this one and I'm in love! It's beautiful. It looks pretty in any kind of lighting. I've received so many compliments! We have received the best customer service as well. We have purchased 4 items from ShaneCo in the last couple of years. We are now customers for life.